NOTE: All photos used with permission and as attributed, by Joe Gross, Jim Gourgoutis, Jim Edgar and Dr. William Bowen. Memory is a powerful thing, and early on this Saturday morning, it hardly seems as if a year has passed. 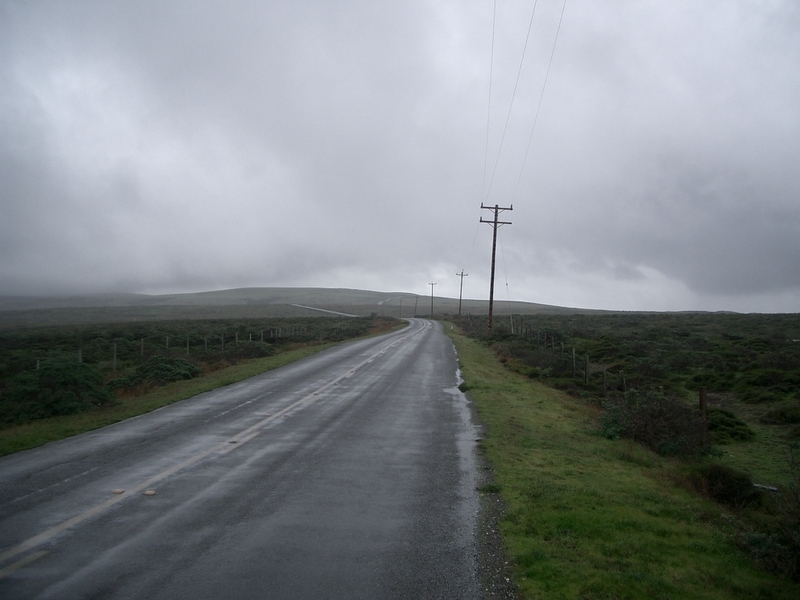 The 2006 SF 200k Brevet is made more fresh in my mind by the rain soaked roads we stand on and the kind of dampness that tells us it is still January and that we're within sight of the Pacific. My friend Bruce Berg tells me that I'm now experienced enough by the brevets I've done (this is (only?) my 11th brevet) to know I can go the distance, and yet still acknowleges that excitement of a kind that may include nervousness can still play a role in how we anticipate this ride. I am excited. And nervous I admit, but this is my nature. We have something on this morning that we didn't have one year before though, and I only needed to look straight up to see it. Stars were visible through some very large gaps in the clouds. I had wanted to ride my mid-1980s Scapin for this brevet. I climb faster on that bike and there will be ample climbing to do this day, but the forecast of 30% Percent chance of Precipitation (POP) and the reality of very wet roads dictated I ride something more practical. I'm hardly slumming with my choice of bike though. My Dave Yates SR is more than a practical choice, it's a stylish one too, if I may say so. After fumbling in the dark trying to remount my front fender, which had been removed for the trip over, dropping tiny little washers in the gravel parking lot in the process, and finally getting all in order, I followed Bruce and Dan Brekke over to the Strauss statue where Todd Teachout will shortly give the pre-ride speech. I only had time to say hello to a fraction of the riders I had hoped to see at the start before Todd is done and the ride is off. 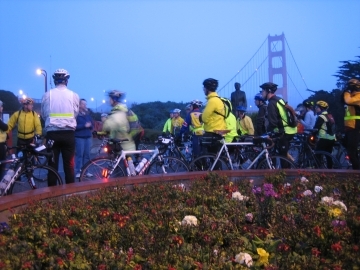 I purposefully waited for other riders to pass over to the ramp to the east walkway over the Golden Gate Bridge. I wanted to ride at least the early miles with Bruce and Dan, but I only managed to find Bruce as the riders funnelled onto the ramp. I didn't keep track of where in the pack I was at all. Two riders, riding side by side on the walkway, effectively corked up a small pack of riders behind them, and from the back of this pack I could not see anyone filling the long gap behind. I made the guess that we must be about half way back in the 92 riders that started the ride and I figured we'd soon be seeing more riders ahead once things opened up on the Sausalito Lateral. The Bay Area can be blessed with some really wonderful weather in January, or at least to the perspective of someone who grew up with the snows of Buffalo as their childhood memories. For several weeks before the January 27th date for the first brevet of the year, the local weather was often very cold, but always sunny. Some of my rides in the East Bay would take me past local reservoirs and mostly those look empty. In fact, it's been unusually dry. So naturally it would begin raining the day before this year's 200km after such a long dry spell. Several friends of mine told me that around 2am they were awakened by the sound of pouring rain. It was not raining as we rolled through Sausalito though and I had faith that the day would be dry, but nevertheless, I had raingear strapped to my saddle. 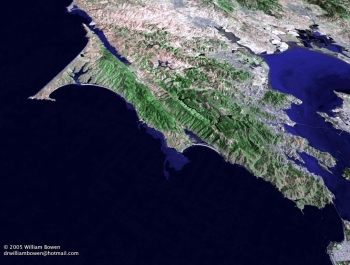 The downtown section of Sausalito runs along the edge of the bay and after a small rise near the Bay Model it cuts underneath Highway 101 and then across tidal mudflats to Mill Valley. 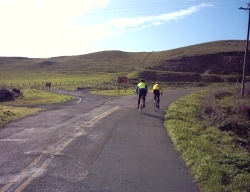 The first climb of the day is on Camino Alto between Mill Valley and Corte Madera. It's not much, perhaps a few hundred feet of elevation gain, but it serves to warm us up and further spread the riders out. Bruce and I had chatted along this climb with a rider from Sacramento. His concern, a valid one, was with navigation on this first part of the route. From the start at the Bridge to Fairfax, CA the route follows the local bicycle corridor along a chain of a half dozen or more little Marin towns. The route sheet is not quite two pages long, and yet close to 90% of the cues are on less than 25% of the route. I rode with Bruce Berg along the bike route section all the way until Fairfax, picking up riders along the way. Bruce's plan was to drop back and meet up with Dan once our current group had grown larger. As there are a great many turns along this part, and even though this is the major bike route, it isn't always marked well at the turns so the non-locals had motivation to stick near us. Once in Fairfax, Bruce dropped back as planned to ride with Dan. That larger group I joined didn't stay intact though as just outside of Fairfax was White's Hill, and hills have a way of magifying any small differences in pace. I ended up catching Zach Kaplan on his recumbent on the way up, and then waited for the sonic boom as he would pass me on the way down. 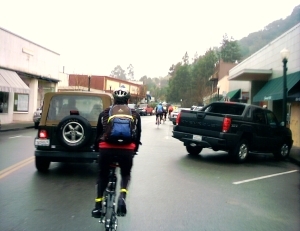 I tried to hold his wheel for a bit going into San Geronimo. I have to smirk now at how futile that ended up being. Sir Francis Drake Blvd, the road we had gained earlier in Fairfax at this point goes into a redwood forest and passes through Samual P. Taylor State Park. The roadway through the park is a bumpy, potholed nightmare and I instead took the bike path through the park parallel to the road but on the other side of the creek. I could tell some of the riders ahead of me had done the same by the tire tracks leading out of puddles and mud spots, but not many riders had done this. The bike trail through the park is far smoother, some of it having been recently repaved, but it is slightly longer and more than probably slower than taking the roadway. I like my fillings to stay in my teeth so I was willing to give up some time here. I rode solo through the park and at the western end of the trail the path goes under Sir Francis Drake Blvd. and joins it at the foot of the climb over the Bolinas Ridge. Ahead, at the junction of SFD and Highway One is the village of Olema. Olema is understood to be the epicenter of the 1906 Great Quake, but while it has a long history by American standards, it remains largely a wide spot in the road, and a much smaller town than the bustling, booming town to the immediate north, of Point Reyes Station and it's 330 inhabitants. While on the climb I could spot two or maybe three other riders ahead, and knew there was one rider within sight behind me. It may be that I had actually gained a little ground through the park as one of those riders ahead of me turned out to be Zach again. Zach, and another fellow Grizzly Peak Cyclist, Steve Downey, had pretty effectively dropped me before the eastern park boundry. I guessed that the other rider ahead was Steve. At the junction with Highway One, Zach and I regrouped and settled in to a rolling chat. Zach remarked that with the enforced time off I had, I clearly had been doing some riding as I was in his opinion riding well this day. I am usually not quite DFL on long rides, but I have more of an aquaintanship with the tail end of the pack than further to the fore. I still figured that we were about half way back in the string of 92 riders. 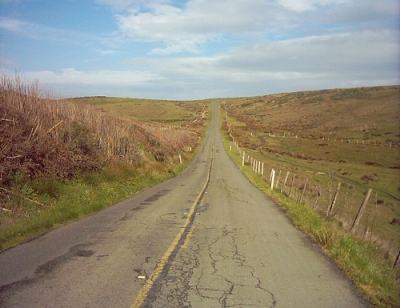 From SFD and Highway One, a quick right and left turn in succession and the route was now heading into the Point Reyes National Seashore Park system. On last year's ride I was riding amongst many more riders at this point, but this year there was just Zach with me and another rider just behind whom I would later meet as Rick. Nobody else was within sight. Equipment wise, these were two good riders to be near as they both sported full rear fenders so riding behind them was not a muddy, messy business, what with the roads still wet. Zach and I both pulled off in Inverness to 'shift fluids' and Rick pedaled on. Inverness, CA is on the west side of the Tomales Bay, a bay formed at the merger of the Pacific and North American plates. Traffic was fairly light here, no doubt due to the mostly cloudy skies that followed the previous night's rain. Not much in the way of tourists out this day, due to the weather and it being past the December peak of the Whale Watching season. My break was over quickly and as I left Zach, he mentioned again that I was riding well, but this time supplied the added information that there were only a handful of riders ahead. Again, I didn't ponder this too much, as 'a handful' adds up differently for different people. As last year, I rode this stretch beyond Inverness solo for much of the way. I could see one rider ahead, and then two as I neared the end of that long leg, but I never could seem to gain ground and hold it. There are no major climbs once you pass the ridge near Mt. Vision back near Inverness, but that is not to say that the road is easy here. Rollers abound and some of those rollers are major ones. 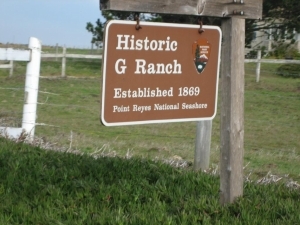 To add to the challenge, there are some historical ranches within the park boundries that are still in operation. The daily business of running these ranches calls for big equipment to come and go from the barns and gobs of mud are tracked onto the road way. Then there are the cattle grates and in one or two memorable spots, both mud and cattle grates. I was very tentative in crossing these grates as last year I went down on the last one which is so nicely situated on a slope. I made it past with out incident and was within a mile of the turn around before I saw the lead riders heading back. 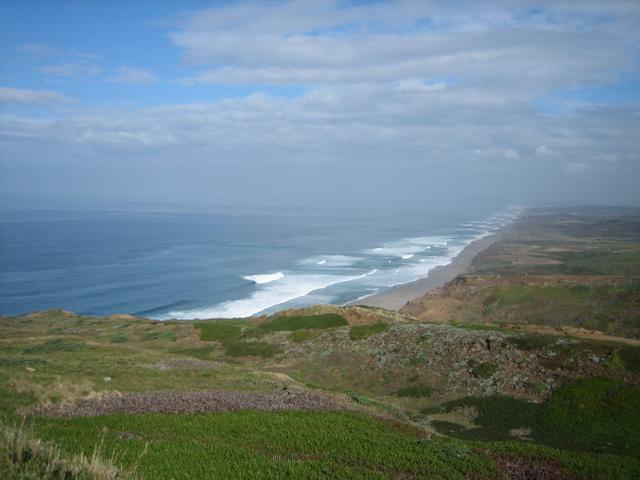 This leg from Inverness to the Point Reyes Lighthouse is an out and back leg, as is the leg from Point Reyes Station to Marshall. I was passed by a couple of riders while at the control. I really wasn't planning on rushing the control and deliberately filled my bottles and mixed some Gatorade, and ate some Clif Shot Blocks (my new favorite ride food). Turns out I actually passed one rider while at the control myself but shortly after leaving Rick caught up to me and we rode pretty much the rest of the ride together. Rick was riding a Longstaff bicycle, a frame he had picked up last March at the North American Frame Builders show. He believes it is the only such frame in the US. As we headed back toward Inverness, we were passed by the bulk of the riders on their way out and I got to catch glimpses of all the bikes those riders were on. Rivendell Bicycle Works was represented, and it's possible that every single Rivendell product was on the ride, except I don't recall seeing anyone riding Dixie cups of bees wax. I may not have been paying strict attention though. 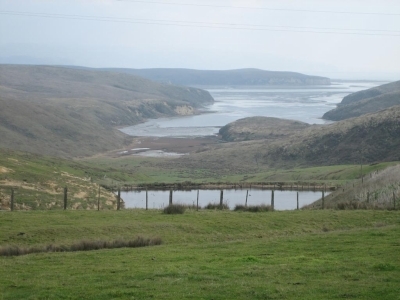 There is no doubt that the landscape of Point Reyes is beautiful, but many I think would modify the description with the word stark. The sky is more than an attribute of the landscape here. I was lucky to be passing through at a time of day when the cloud gaps permitted sunlight to make the wet, green hillsides stand out against the blue and white of the sky. To the north one could get long sweeping vistas of the waves breaking on the beaches for miles on end. Back on Highway One, past the tourist traffic that seemed to have picked up in Point Reyes Station, the road surface improves dramatically right at the town boundary sign. 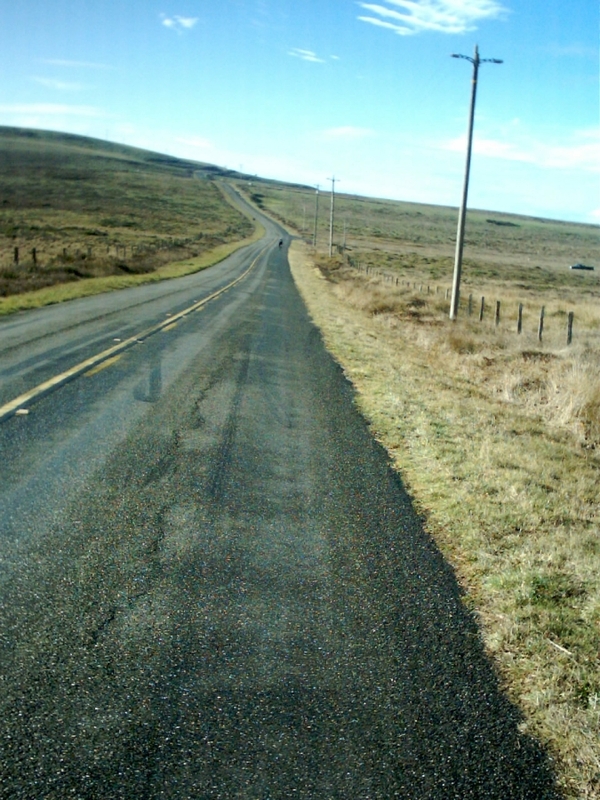 Highway One is a curvy, swoopy carnival ride, even once the roadway makes it's way back to the shores of Tomales Bay. Rollers, some big and some small, are what makes up the challenge here and Rick and I traded off pulling up the hills and down again all the way to Marshall and the 2nd control. About 2 miles out from the Marshall Store we were passed by the lead group going in the opposite direction. So far, we had only lost a small bit of ground on them. Unlike a year ago, we weren't the only riders out enjoying the roads in Western Marin this day, but even still I was pretty sure which riders that had passed by in the opposite direction were brevet riders and which weren't and I estimated about ten riders were ahead of us. In the Marshall Store I had a cup of clam chowder (great stuff, but maybe not the best thing for ride food) and a half pint of chocolate milk. While there, a couple more riders arrived and they didn't pause to eat much, just getting their cards stamped and moving on. I managed to get out the door and on my bike as they were pulling away and I hustled to catch on to the pace line. The reason for my haste was because there was now a headwind which would last most of the rest of the way back and I wanted company if I was going to do battle with that headwind. The effort paid off in the very short term as I was able to latch on. The group included three very strong riders, riders that I have historically never been able to keep up with. Mark Homrighausen from my club was there, as was Bob Buntrock and Mojo Cosgrove who was, unsurprisingly, doing the ride on his fixed gear. On the way back the route climbs one last huge roller before Pt. Reyes Station and Rick and I both dropped off the paceline. With an effort I would later pay for, I managed to latch on two more times before the turn at Platform Bridge Road but a 40 yard gap just grew and grew until the undulating topography kept the group out of sight ahead. I rolled around the Reservoir and through Nicasio and just past the 100 mile mark of the ride I decided I had earned a rest. I had done the 100 miles in less than six and a half hours, not dramatically fast but not slow either given the hilliness of the ride so far. Trying to tail much faster riders had me a bit overcooked and the climb ahead, over Nicasio Valley Road to San Geronimo always is tough for me. Rick caught up to me while I waited and I joined him as he rolled by. I was paying for the effort of trying to hang on with the faster riders and the climb up the hill was draining, just like I suspected it would be. There was one more big hill before Fairfax and it wasn't until I was going down the back side of White's Hill coming into town that I was getting my energy back. I couldn't do well to name the streets and turns by memory, but riding the bike route from Fairfax to the Bridge is as close to automatic as I can get. Along this way it is generally flat with the exception of the hill on Camino Alto and finally on the climb out of Sausalito back to the bridge. My strength was back for both of those climbs and I was able to stay with Rick and even lead out a little bit. Funny how that comes and goes on a long ride, but there it is. Waiting at the finish was most of the fast group, including club members Peter Morrissey, Steve Downey and Mark H., both of the latter two riding their first brevets. Also on hand was Sterling Hada who had to miss the ride due to classes he was attending, but nonetheless came out to see the riders finish. Peter chided me on how clean my bike was, joking that I must have taken a ride in the back of a pickup truck. Well, full fenders and a mudflap on the front will make that difference. Last year, I finished in the dark and rain in 11 hours and 8 minutes. This year it was still daylight for some time and I finished the 125 mile and change course in 8 hours and 23 minutes. What a difference a year makes. It was good to ride with so many of my club mates on this ride. The Grizzly Peak Cyclists had a good number of the 92 riders. I missed chatting with several people before and after the ride, but I did see Jim G. and Carlos Duque a couple times on the ride and Jim Edgar was spotted halfway out along the Point fixing a flat. All looked to be riding well and strong. Photo by Jim Edgar, 1-27-2007.